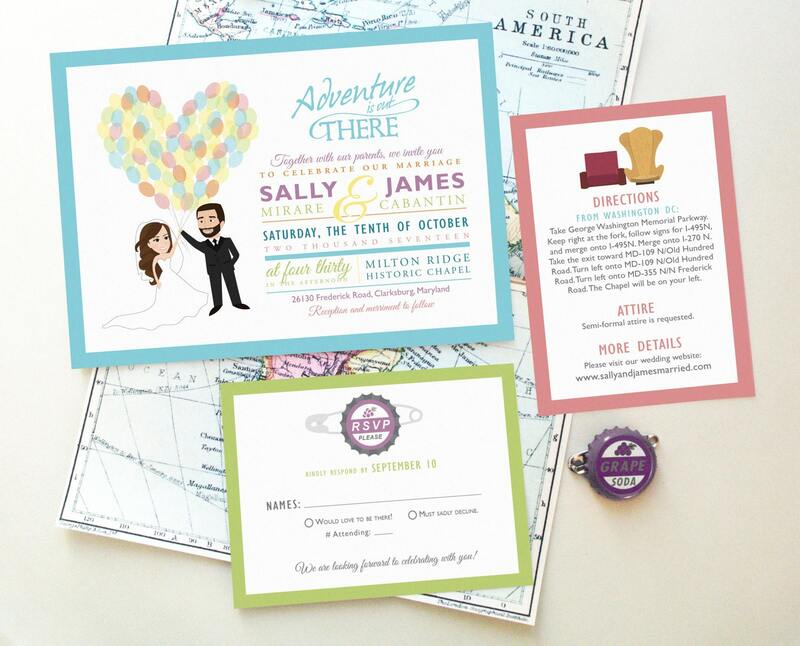 A personalized printable wedding invitation suite inspired by Disney/Pixar's Up, with custom caricatures holding balloons floating into the sky. The theme is "Adventure is out there!" The RSVP card has a drawing of Ellie's grape soda bottle-cap badge, and the directions card shows Carl and Ellie's chairs. Your price includes all final print-ready files for printing at home or a local printshop. The printable wedding invitation suite has the standard sizes of 5x7" Main Invitation, 3.5x5" RSVP card and 5x3.5" Information Card. All sizes fit standard US envelopes. Other sizes can be requested in the Notes section of checkout. Once the order is placed, I will send you a proof within 3-4 business days, and will work with you until your files are absolutely perfect for printing! RUSH OPTIONS are available - please contact me for details. **** Size of cards (if different from the standards listed). **** Color choices for borders and/or fonts, if different. The above color chart displayed some commonly picked colors, however, if you have a specific shade you'd like, I would be happy to use a custom color. If you like the colors displayed in the example image, please mention "colors as is." **** Invitation wording for each card. After checkout, please send photos to me via Etsy message or email sameeha [!at] theinkedleaf.com. I include unlimited revisions and will work with you until perfect! LOVE LOVE LOVE our wedding invitations!!! Thank you for creating such a beautiful invite for our big day and for helping us along the way in making it just right. Sameeha was so helpful and accommodating to all questions and revisions that needed to be made. She was quick in response time as well as prompt with turnaround for the invite. I would definitely use her again for other parties and events that I have. LOVE my wedding invitations and I can't wait to send them out! Thanks Sameeha! Great sign, easy to print.